While the capital of Quito is most travellers’ first stop on an Ecuadorian itinerary, many end up in Guayaquil as it’s the gateway to the Galapagos Islands. What many don’t realize is that the coastal city is actually the country’s largest metropolis, an economic hub and home to nearly four million people. This is hands down one of the most entertaining places I have ever been. Iguana Park is exactly what the name implies—a beautiful plaza overrun with huge iguanas! Also called Parque Seminario, it looks rather unassuming as you stroll through the beautiful iron gates, which open to a statue and gazebo framed by the backdrop of a beautiful cathedral located across the street. The real fun begins once you get about halfway in, and realize there are iguanas EVERYWHERE! In the trees, on the pathway, in little ponds, on the grass…frankly you have to watch your step as there is an extremely good chance you could accidently step on one of their long tails. I have to admit, I had a little freak out when one ran by and brushed against my bare leg…ick! Some of them are also quite large, which is pretty cool for those of us who don’t live in places frequented by reptiles. Don’t go right at noon as the iguanas are sleeping and will be hiding in the trees. Look up. There are lots of iguanas hiding in the tree branches overhead, and they’ve been known to fall onto people walking below! The recently built Malecon is Guayaquil’s pride and joy. The boardwalk winds along the coast, overlooking the Guayas River (which is a lovely shade of chocolate brown—ha!) and is about 2.5 kilometres long. Along the route you’ll find shops, restaurants, lovely gardens, an amusement park for the kids, a water park, a huge movie theatre and a number of historical monuments. A dock about halfway through serves as the boarding point for boat rides, and visitors can take advantage of everything from a motor boat ride to a journey on a pirate ship. There are also some great lookout points which will give you a better view of the surrounding city. When picking a hotel, look for one near the Malecon as this is where most of the sites are. I had the pleasure of staying at Hotel Oro Verde, and highly recommend it—especially considering how affordable it is given the amenities like a big gym and pool. After being picked up at the airport by the complimentary shuttle, we were greeted by a friendly doorman who ushered us toward the fresh juice and cool towels in the lobby. Our modern room included perks like robes, slippers, a spa-like bathroom and mini-bar, but what was even more incredible was the welcome gift that arrived just minutes later. Everyone staying at the hotel as part of a group (so basically anyone heading to the Galapagos) is given what I would describe as a tower of chocolate—there was no way we could eat it all! I get the feeling food is a big thing for these guys, because when we showed up for the complimentary breakfast the next morning, there was more food spread out in front of us then I have seen in my entire life. I am not exaggerating! The offerings covered about four long tables, including a made-to-order omelet station and freshly-carved roast beef. Final tip: If you need lunch, head down to the deli attached to the lobby—the paninis are incredible! How to get around: Taxis are inexpensive and most sightseeing spots are located within a few blocks of each other. That being said, it can be VERY DANGEROUS and tourists have been killed when an armed robbery starting with hailing a taxi goes bad. The best way to avoid trouble is to only get in a cab provided by your hotel. If you’re out walking and need to hail a taxi, walk to the nearest chain hotel and they’ll be able to provide one for you. 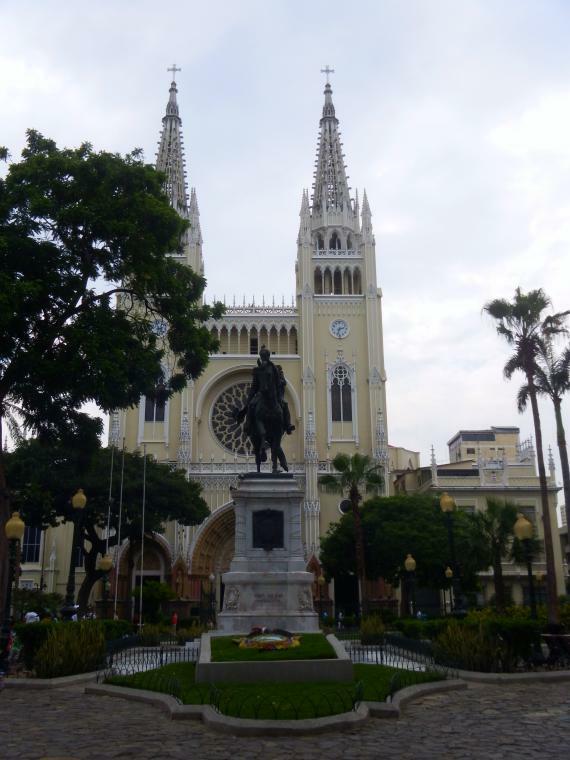 When to go: Guayaquil has hot weather year round, so locals suggest visiting in August when it’s a little cooler (relatively speaking!). It’s important to note many shops are closed on Sunday, so keep that in mind if you’re only in town for a day. Wow that place is overrun with them! It’s like one of those places overrun with monkeys which act as a visitors attraction, only there is less chance of your camera being stolen. Guayaquil es una ciudad que acoge al turista con amor y entusiasmo, en esta ciudad se puede disfrutar de lugares naturales cercanos y de un ambiente relajado.